to arrange a screening in your area. The latest damning IPCC report published this week states that we have just twelve years to stop runaway climate change by moving the global economy away from fossil fuels – and many scientists are calling this a conservative estimate. Two videoactivists from the London based Reel News collective went to North America this year to look at grassroots organising on the ground with a climate change denying president in charge. What we found were visionary struggles starting to implement a just transition through collective action which, if combined with our experience as a movement here, could lead to climate change being seen not as a threat, but as an opportunity to create the communities we want to live in and at the same time put right historic injustices and inequalities. 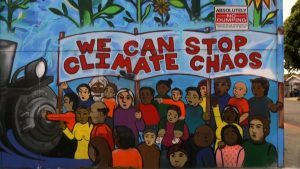 In the 14 states we visited, it was very noticeable that combating climate change is a movement led by working class communities in the USA – and one that is completely integrated with the struggle against austerity, racism, mass incarceration, rights for migrant workers and gentrification. For example, Hurricane Katrina in New Orleans – an early extreme weather event directly linked to climate change – was used to force black working class communities out of the city and gentrify it, while accelerating the privatization of schools. People quickly began to realize that you can’t fight one aspect of neoliberal capitalism without dealing with all the others. Richmond, California is a prime example of a working class community we can learn a lot from. A city of 110,000 with over three quarters of the population being Black, Latino or Asian, Richmond has been dominated by the oil giant Chevron for the past 100 years. Living next to the oil refineries, there are serious health problems – particularly cancer. Yet only 5% of the refinery jobs go to local people. Chevron had historically bought off local politicians to look after their interests – so despite there being very strong social movements in the city, protests often had limited effects. So in 2014 the people decided to stand their own community candidates. Despite Chevron spending an astonishing three million dollars on a local election, every one of their candidates lost. Since then not only has Chevron’s power been curbed but they have been forced to build the largest publically owned solar farm in the Bay area on their land – and in addition Richmond now has the highest minimum wage in the state, rent controls have been introduced to fight gentrification and police violence has been reduced through a new community policing model. All these were demands coming out of the social movements, who have now formed the “Our Power” coalition – a movement of movements building what they call a just transition framework where there’s a planned transition to renewable energy, led by the people who live there so that they benefit from the transition. So they have movements opposing mass incarceration – which they see as part of the extractive economy, extracting people and skills out of their community who could be doing useful work – working alongside housing movements, food growing networks, bike coops reclaiming space in the city and many more, to re-imagine the community they ideally want to live in and how they want to organize it. Increasingly, this process is being managed through local assemblies starting from people’s immediate needs and priorities. Perhaps the most visionary project we found was Cooperation Jackson in Jackson, Mississippi – an 80% black, overwhelmingly working-class and overwhelmingly impoverished city in the heart of a state run by the Tea Party, or as local people describe them, “Trump on steroids”. Jackson was one of the key centres of the civil rights movement in the 50s and 60s as people bravely fought back against the violent reality of Jim Crow laws – and now it’s inspiring movements throughout the USA again with a revolutionary just transition model, with people’s assemblies at the centre of it. In a city with over 50% permanent employment, Jackson is income poor but resources rich in terms of the skills that people have. So they’ve started building what they call a solidarity economy, based on a network of workers cooperatives exchanging skills and resources with each other and reducing the need for money. The latest cooperative getting underway is a 3D printing and fabrication coop, where local people can come in and get trained up in the new technology, and then use it to build what they need – from shoes to houses. The coops are being set up on land strategically bought up while it was very cheap in the heart of impoverished Jackson, right next to affluent downtown – intentionally acting as a barrier to further gentrification. Significantly, Jackson is another city where radical councillors have gained power – but Cooperation Jackson have drawn back from the electoral path, arguing that an assembly based movement on the ground needs to be greatly expanded to make sure that councillors carry out the wishes of the people. Without that, the danger with a limited budget is you end up implementing austerity – as we’ve seen happen in the UK. We found many more inspiring struggles, from ex-coal miners in Harlan County, Kentucky – one of the centres of historic militancy of the U.S. trade union movement – organising to end coal and move to renewable energy to bring back jobs, to teenage organizers in the Puerto Rican community in Brooklyn, New York fighting gentrification and organizing a grassroots just recovery from the devastation of Hurricanes Irma and Maria in Puerto Rico, to First Nations activists all over the country, inspired by the epic battle to stop an oil pipeline at Standing Rock, now blocking new pipeline and fracking projects. There are inspiring struggles happening here too. The battle to stop fracking is well known, but maybe less well known is the occupation at the BiFab yard in Scotland last year to successfully stop its closure. BiFab used to manufacture platforms for the offshore oil industry, but now makes platforms for wind turbines. Significantly, the workers said no retraining was required – it was exactly the same skills needed, showing how easily we could make a transition in a lot of areas. When the privatized company that ran the yard tried to shut it down and sell it off, the occupation forced the Scottish government to step in with a £15 million loan to keep it open. This has opened up a conversation on what could be achieved with a bit of planning. Research by Stephen Salter at Edinburgh University shows that if wind and tidal power were to be implemented on the north-east coast of Scotland, enough energy could be produced to power the whole of Europe and create thousands of jobs – so why are we allowing future projects to be at the mercy of the market? We’re now organizing a UK tour to take films of all these struggles around the country, bringing people together to discuss and plan a just transition led by workers and communities in order that we benefit, not the bosses. We’ll be doing the tour in conjunction with the Million Climate Jobs campaign and have already got interest from UNITE Community branches, particularly in communities where industry has been devastated. Whatever you’re fighting for in your community, we’d love you to come along. We’ll be filming inspiring struggles and projects that are already underway as we go and show these at subsequent screenings – as well as sending the information back to activists in the USA so that we can start linking up and supporting each other’s struggles. The “American Climate Rebels: Just Transition tour” starts in January: contact info@reelnews.co.uk to arrange a screening in your area. Pre-tour London screening on Pre-tour London screening on Tuesday November 20, 8pm, Effra Social, 89 Effra Road Brixton SW2 1DF.